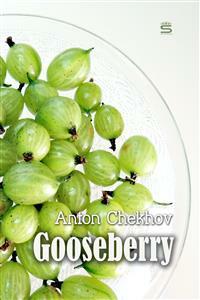 Nikolai Ivanich has never reconciled himself to life in the city and makes plans to acquire enough money to buy a small estate where he can grow gooseberries, a symbol in his mind of happy life in the countryside. He saves every penny and spends his days dreaming of the future estate: where the main building will be located, ducks swimming in a pond, and where the Gooseberry bushes will be planted. His brother sees it as an escape from reality and an unnecessary limitation. THE whole sky had been overcast with rain-clouds from early morning; it was a still day, not hot, but heavy, as it is in grey dull weather when the clouds have been hanging over the country for a long while, when one expects rain and it does not come. Ivan Ivanych, the Vet, and Burkin, the high-school teacher, were already tired from walking, and the fields seemed to them endless. Far ahead of them they could just see the windmills of the village of Mironositskoe; on the right stretched a row of hillocks which disappeared in the distance behind the village, and they both knew that this was the bank of the river, that there were meadows, green willows, homesteads. And if one stood on one of the hillocks one could see from it the same vast plain, telegraph-wires, and a train which in the distance looked like a crawling caterpillar, and in clear weather one could even see the town. Now, in still weather, when all nature seemed mild and dreamy, Ivan Ivanych and Burkin were filled with love of that countryside, and both thought how great, how beautiful a land it was. Ivan Ivanych heaved a deep sigh and lighted a pipe to begin to tell his story, but just at that moment the rain began. And five minutes later heavy rain came down, covering the sky, and it was hard to tell when it would be over. Ivan Ivanych and Burkin stopped in hesitation; the dogs, already drenched, stood with their tails between their legs gazing at them feelingly.